Credit: Courtesy of Sacré-Cœur Parish Sacré-Cœur Roman Catholic Church, n.d. 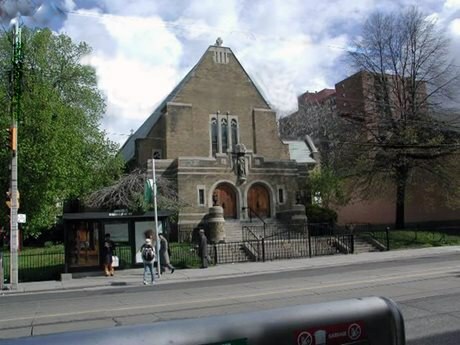 In 1887, Sacré-Cœur Parish was founded as the first Roman Catholic parish to serve the French-Canadian community in Toronto. Father Philippe Lamarche came from Montreal to found the church and served as priest until his death in 1924. The parish's first church building, located on King Street near Sackville Street, was purchased from a Presbyterian congregation in 1888. Since that time, francophones have been able to worship in their own language at Sacré-Cœur. This building was designed and constructed for worship and was blessed in 1937. In 1951, the structure was enlarged to accommodate a growing congregation. Sacré-Cœur has served both as a spiritual and cultural centre for many of its French-speaking parishioners, who emigrated from Quebec, the Maritimes, northern Ontario, Europe and more recently from Africa. Visit the plaque – On the northeast corner of Carlton and Sherbourne streets, in front of the Sacré-Cœur Church, Toronto.